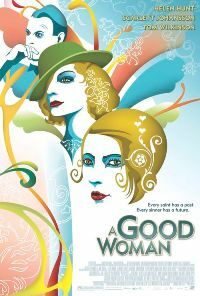 Helen Hunt is Mrs Erlynne and Scarlett Johanson is Mrs Windermere in this competent version of the Oscar Wilde play Lady Windermere's Fan. There are some nice sets and costumes and some scenes are well photographed but the overall the film is very flat. The dialogue contains some of the great witty lines from the original play, but the delivery is so deadpan the humour is lost. It looks nice as a costume drama but the wit of the play has been lost and Helen Hunt and Scarlett Johanson's performances are stiffled by the director.